This post was created in collaboration with My/Mo Mochi. All content and opinions expressed are my own. Thanks for supporting those who support Style-Wire.com. Doesn't matter what time of day, cravings hit me hard! Ramen, clam chowder, fried chicken; if I'm craving it, I won't be satisfied till I have it. The other night I was burning the midnight oil editing a few pieces in bed when the craving hit... soft, ooey-gooey, mochi dough... sweet milky ice cream... I was craving My/Mo Mochi! Mochi is one of my favorite snacks, ultra portable (thanks to that ooey-gooey mochi dough and flour coating), and while it has ice cream, it's not just for desert! Mochi is the perfect snack any time of day. Like midnight! Now, my boyfriend kind of hates when I eat in bed (he says bed is a clean place, whatever that means) but since mochi doesn't need a spoon or have a sweaty container sweating with condensation, I think mochi is ultimate bed appropriate snack... He can fight me on that one later! Of course, I wasn't the only one who wanted some mochi. As soon as Evie laid her eyes on my midnight snack, she wanted in! I don't blame her. I had a few different flavors of My/Mo mochi stashed away in the freezer. We snacked on Strawberry, Sweet Mango, and Cookies and Cream before getting back to work. 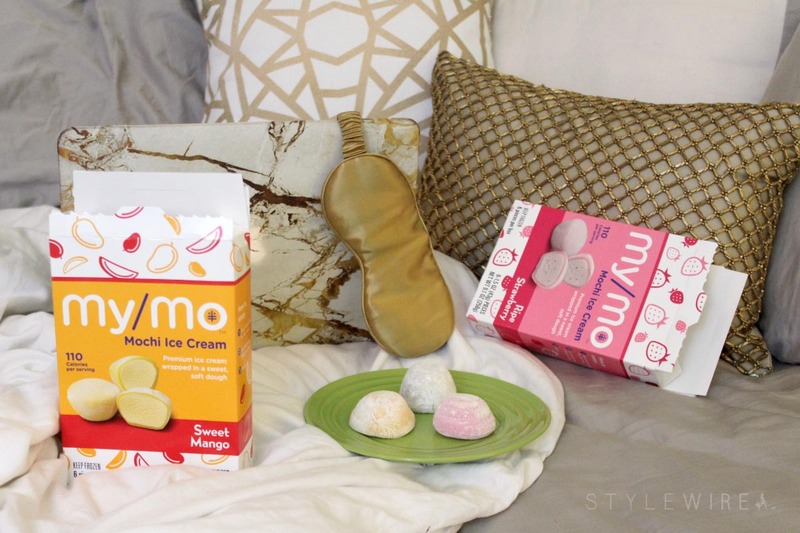 If you've never tried mochi you have to give this snack a try! It's also available in Green Tea, Double Chocolate, Vanilla Bean, and Mint Chocolate Chip; use this link to find a retailer near you and try all of the My/Mo Mochi flavors for yourself!